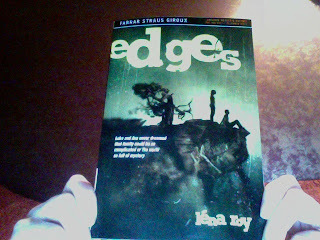 Léna Roy: EDGES: Advanced Reader Edition! There it is! My baby! The cover of the bound galley, otherwise known as the Advance Readers Edition! Isn't she beautiful? I am posting the picture I took of it with my computer - see my hands holding it lovingly? - after being cautioned by my husband to see if it's a-o-k with FSG - but I think it's okay, I mean, you're all my friends, right? This is nothing official . . . If anybody from FSG is reading this and thinks it's a no-no, mea culpa and I will delete this post! The front says (which looks bleary in the picture I took): Luke and Ava never dreamed that family could be so complicated or the world so full of mystery. Are you intrigued? It was thrilling to get a Facebook message from a neighbor who wrote that there was a package for me in the basement! I had just come home from teaching at Writopia, and having a hot chocolate date with my eldest son. My son, upon hearing me shriek, offered to go straight down to the basement to retrieve said package from where our deliveries go. He ran down, then ran back up again, and we were breathless together. He handed me the package and I ripped open the top, and in it were two copies of a book that I had written - looking like a real book! I brought a copy of EDGES to Writopia this morning to show it off - and I ended up parting with it when my fellow writing teacher and friend Courtney Sheinmel asked if she could read it! "I'll take good care of it, I promise," she said. Why did I hesitate? I wrote the book to be read, didn't I? And what an honor to have Courtney Sheinmel be my first reader! "I'll bring it Tuesday . . ." I'll only have to wait a couple of days for a response! Tomorrow, Monday: ARC show and tell with Lila Castle and Monday also means Megday, writing with my mentee! I am so excited for you. The cover looks great! I cant wait to read it. I am sure it will be good. Pina - thanks so much for your enthusiastic support! It means a lot! And you too, my Queen! Thanks so much for letting me read it! I was so honored (and thanks for giving me an extra day, due to cartwheel shenanigans). It was just beautiful -- intense, and heartfelt, and real, and memorable. I keep thinking of that one line I told you about. Can't wait to buy my own official copy in Dec, get it signed and put it on my shelf of signed books! I am happy to see this advanced reader addition because it can provide us precious knowledge for phd proposal writing service and for other purposes anyway i really like the cover of this book.